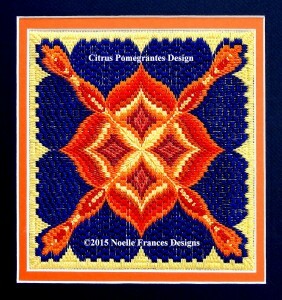 Citrus Pomegranates design is a Bargello needlework embroidery presented within a 60-plus page booklet available in printed and Kindle formats. The pomegranate shapes, a classic Bargello pattern, are worked in the bright colors of citrus fruit and the dark cobalt blue of my favorite kitchen bowl for displaying oranges and lemons. 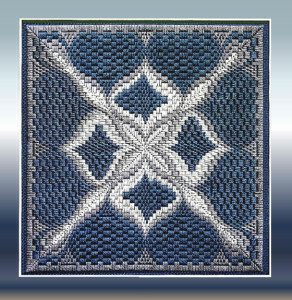 This design utilizes the traditional Bargello method of needlework straight stitches worked in steps to create the design. Click the button named Hardanger on the upper navigational bar of my blog website at Noelle Frances Designs to view my discussion of the Bargello straight stitch and how to start and end your stitching thread without the use of knots. This 145w by 145h size design is approximately 8 inch square when work on 18 count canvas. My booklet Citrus Pomegranates Bargello, 50-plus pages in length, is offered in e-booklet format and printed as a 8 by 10 inch paper bound booklet. Click the below photo for ordering or to access the Look Inside feature to view a few pages of the booklet for the Citrus Pomegranates Bargello design. This is one of my favorite photos. 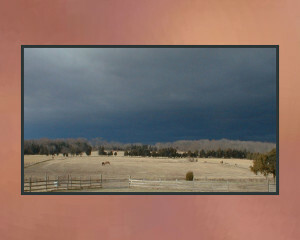 It was taken as an early March snow storm was moving into our area several years ago. I like the range of the sky’s slate colors, light grey through soft blues and decided to also work the Citrus Pomegranate Design in these colors. Below you can see Citrus Pomegranate Design worked in my Winter Colorway. I added a Section 10 to the Citrus Pomegranate booklet listing the threads used for the winter colorway and pattern changes that I incorporated within the four center pomegranates of the original chart.